Haselmeier’s new D-Flex Just One has won the GOOD DESIGN™ Award. This especially flexible disposable pen D-Flex stands out in the market primarily thanks to its uniqueness. Deployed flexibly, it helps deliver patient safety, used with 3ml cartridges. 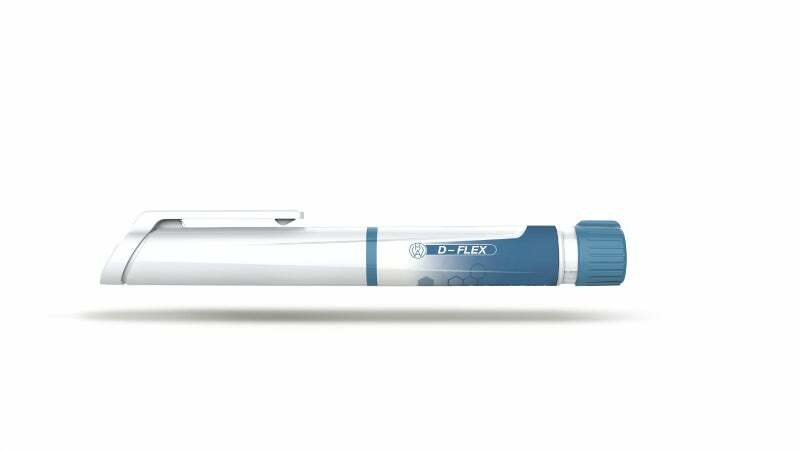 It closes the gap between fixed-dose pens, which only allow a single fixed dose, and variable-dose pens where the dose can be finely adjusted by the patient. The D-Flex can be configured for several fixed doses. These dose values can essentially be freely selected when assembling the pen. The system only permits set doses and the patient cannot select an unintentional dose by mistake. This significantly reduces the risk of any operating error and increases the safety of the patient. This makes the D-Flex the ideal, flexible platform for adapting to set doses in accordance with the therapy. This platform can be flexibly configured to suit desired dose values, from the first clinical study to series production, thereby significantly reducing time-to-market and capital expenditure (CAPEX). Strategic product manager at Haselmeier Stefan Gaul explains: "In line with the needs of the market, we at Haselmeier were looking for an improved solution for unconventional or somewhat more complicated applications. "Aspects such as patient safety and convenience of operation and handling were central elements of the process. The idea of designing an extremely flexible, strong platform for our customers was naturally a central aspiration. With the D-Flex we have found the ideal way to put this into practice. And it is all the more gratifying when the product design is explicitly appreciated by outside bodies. "But above all, it is a good feeling to know that an innovation is far enough advanced in the development process to ensure that patients can be helped within a few years."